Am I in 4th category? Even after discovering the mission, one need to plan out one's life. Mananeeya Eknathji tells us four types of people and prompts us to think as to which category we belong. He says : There are four types of people in the world. The first type is represented mostly by primitive people. They plan for the day only. If there is at least some food for the day, they will not go out of the house to get more but will sleep. They do not thik of the morrow. The second type includes merchants and businessmen. They plan for one year only. They are indifferent to next year's business or profits. The next year, according to them, will take care of itself. People who plan for this life only, belong to the third category. These people enjoy this life with utmost pleasures and happiness and do not even believe that there was a past life or there will be a future life. This life is their only concern. "In this world every day people go to the house of death, but still the remaining people believe that they are eternal. What greater wonder than this can there be?" So people of this category believe that they are immortal and they have been born just to eat, drink and make merry. The fourth type of the people think seriously. They believe that there was a past birth for them and there is also a reincarnation for them. They look at the animals, birds, reptiles and other creatures and think that they have also been created by God, but He has made human beings having intelligence. Why? What use of that intelligence they have made and they are to make? After many such queries the purpose of their life dawns upon them. They awaken from a long dream, as it were, and remember that life is very short and the energy given to them is limited. They determine that every ounce of energy should be very carefully utilized for the fulfillment of the purpose. They plan very scrupulously and see that only that which is beneficial to their plan is accepted and that which is detrimental is summarily rejected. Thus begins a purposeful life! Eknathji gives the simili of our human body and tells us that let it not end up with the story of maintenance. He says : This body is an energy-generating machine. We maintain it very carefully. We brush the teeth early morning and we call it morning duty. Thus maintenance is duty. We give food and water to this body for its upkeep and so many other things are done for the same purpose. With all these duties done to body, do we become Nachiketas? An introspective mind should get questions about the utility of all these limbs and various parts of our body. Each one who grows from deh-buddhi to Atma-buddhi gets questions like : But what is the output? We maintain the body throughout the entire life. But no work, no operation, no function, no output? Why are these eyes, teeth, ears, etc. given? What is the purpose? Have I realized the purpose? And if so what steps have I taken to serve the purpose? And if so what steps have I taken to serve the purpose? Why I have been born in India only and why not in Africa or in some other country? This land has given me so much, what is my contribution in return?" One must be in a position to say at the last breath, "I have not lived in vain. I have given much more than I have received. There is no liability on me. On the contrary, I have assets to my credit". In childhood question of the mission does not arise, but in youth, after so many queries the mission is discovered, then the real life starts. There we must start planning in right earnest. "A purposeful life is a planned life and there is no importance to personal instincts. Man should not be a product of atmosphere; he should not be at the mercy of circumstances. If the river flows from east to west and if one has to go to the east, he must go against the current." 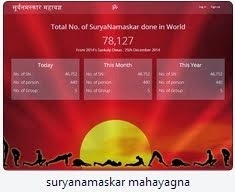 The website has been started on Rashtra Chintan Diwas, a First day of Samartha Bharat Parva, and till now 8,35,368 Suryanamskars have been registered. The calendar is made by Group of Karyakartas from NorthEast with utmost care to include all the details, it's available in xls, pdf & month-wise pdf. Eknathji says : Our present life is the outcome of the actions in the past lives, either good or bad. The chain of life is without a beginning and the present life is just a link in the chain. One should think, "I have been provided with desires, thoughts, environment and other necessary things. My life must not be purposeless. What is the purpose for which I have come in this world? It must have been ordained by the Divine Power for me. I have to discover it." Here Mananeeya Eknathji brings out an important point. He says : Discovering the purpose of life is the vital point. Life begins for us when we come across the mission face to face and get to the core of it. The body is the energy-generating dynamo. We have a machine which operates a certain function. We maintain the machine very meticulously. Day by day, week by week, we open the machine, clean the parts, again put it in order, oil the same and cover it carefully to protect the same from dust. The upkeep is ideal. But this does not serve the purpose if the machine is not operated to perform its function. What is the output of the machine? Motor car, sewing machine, generator, these are all maintained very nicely to serve some purpose. Let the life be not a story of maintenance. Let it be of some use. Eknathji tells : You fix upon the goal, evaluate your powers and potentialities thoroughly and the mission dawns upon you as it dawned upon Swamiji. These days it is advised to do SWOT analysis - Strengths, Weaknesses, Opportunities, Threats - and find out the best course that is available to one. Eknathji further says : Everything in this world is purposeful. Nothing is without a purpose; even an atom has its own purpose in this expansive, vast and endless universe. Having known this, we have to again introspect and find out what is the purpose of my life. What work am I suppose to do in this Kingdom of God? Slowly it would take us to the thought that There is nothing accidental. Because we do not know the purpose of causation, we feel the futility of germs, mosquitoes, flies and insects; but the creator of the universe has a purpose set for them also. Eknathji further illustrate this with a story : We know the parable of the mountain and the squirrel. The mountain first scoffed at the squirrel saying "What is the use of your insignificant existence?" The squirrel smiled and replied, "That I do not carry forest on my back like you, is a fact. That you cannot crack a nut like me, is also a fact." Thus everybody has a purpose to fulfill. Once we understand this, we can reorient ourselves fully in such a way that every act also can become useful and would take us to the goal. Mananeeya Ekanthji says : the human destiny or goal is a settled fact and that there is no compromise in that. Swamij had said : Whether we will it or not, we shall have to return to our origin which is called God or Absolute. We all came from God, and we are all bound to go back to God. Call that by any name you like, God, Absolute, or Nature, the fact remains the same. "From whom all this universe comes out, in whom all that is born lives, and to whom all returns." This is one fact that is certain. ... Man comes from God in the beginning, in the middle he becomes man, and in the end he goes back to God. This is the method of putting it in the dualistic form. The monistic form is that man is God, and goes back to Him again. Individual mission has to be fixed for reaching that destiny and we do not believe that it can be acquired in one life only. We admit that there is a long chain births and this is only one link in it. Life after life, this soul is marching on a great pilgrimage. The human goal is for the human life consisting of all lives taken together and the mission is for this span of life only. With the example of Swamiji, he further makes it clear : Swamiji had realized the human destiny; it had dawned on him. But he was not aware of his mission to reach the goal. He discovered it here at Kanyakumari. Every individual has to discover the mission, one day or the other. Ekanthji purposely uses the word "discover" because it is not to be found out after a search from outside. It is within you, it is covered because of the absence of a definite goal. There are many people who have not decided about their goal even at the age of sixty, when it is the evening of life and death is just knocking at their doors. Life should not be like a person who goes to a huge library, sees so many books, reads none and gathers no knowledge. "Rolling stone gathers no moss". Only fortunate people decide their goal at the dawn of their life. They have the satisfaction in the evening of life, that, they had not lived vaguely, and wasted time in searching for the goal. Life should be like an arrow hitting the target directly and not going off the mark. Life is like the game of Kabaddi. One can show his skill and play a fruitful game only as long as the breath lasts. Otherwise one moves about here and there, shouts, dances and returns empty-handed. Futile is his play. One must have the full satisfaction of having accomplished one's goal when one breathes one's last. Otherwise, embittered by frustration, one will exclaim "life's morning and noon have already gone, the evening has crept in and now the sun is about to set. What have I gained?" Swami Vivekananda understood the goal of life at the feet of his Guru. There are hard days and easy days too. But it is the time that will decide the exact mission of one's life. There is no compromise and no concession in that. Life is full of obstacles and difficulties. It is like the river which has to reach its destination, the ocean. It is not an air flight. So Swamiji also doubted and doubted, and ultimately at this southernmost end of the country, at Kanyakumari, he discovered his mission. As a matter of fact, the mission dawned upon him. When such a mission is fixed for anybody there is only one road to reach it, all other roads are blocked for him. Like a commander, decide the mission to be fulfilled and then plan the strategy, taking into consideration the power, the potentialities and the limitations. Think of the best manner in which the goal is to be achieved. 'Ifs' and 'buts' have no place in this. After a stern determination, not only the goal and the mission are fixed, but a master-plan will have to be prepared and all the strategy necessary to accomplish it must be settled. Then and then alone something noble can be achieved. You must refuse to be a slave of circumstances. You must create circumstances. And for that understand the realities of life : Time at your disposal is very short. There are hundreds of Arts and Sciences; we cannot even think of them, leave alone the idea of even knowing them and much less the idea of mastering them. Life is short and knowledge is vast. So we must choose the proper mission and utilize the whole life for it. "One life, one mission" should be the ideal. And if this is to be achieved, then we have to keep in mind the geet : saj-dhaj kar aave aakarshan, pag pag par zoomate pralobhan, hokar sabase vimukh batohi, path par sambhal sambhal chalata hai...jeevanbhar avichal chalata hai...There are a number of attractive things in life, but if they do not fit in with the master plan that we prepare for the accomplishment of the mission, we must refuse them, however good they may be. Thus, we must possess the discrimination of selection and election in life. There are many people who have not decided about their goal even at the age of sixty, when it is the evening of life and death is just knocking at their doors. Life should not be like a person who goes to a huge library, sees so many books, reads none and gathers no knowledge. Here Eknathji's own experience is worth remembering. It shows how he himself mould his life to be a purposeful one : Mananeeya Nivedita writes in 'Eknathji' : Eknathji went to Belur Math, Calcutta in March 1962, for studying Swami Vivekananda's Complete Works and to cull out the required ideas and message to make appealing presentation. When Eknathji entered the library, there were many good books on the lives of Sri Ramakrishna, Swami Vivekananda and many of the direct disciples of Sri Ramakrishna. There were books also about their teachings and inspiring conversations with other devotees. There was a great temptation to read those books. Even if he were to scan some of those books, it would take at least a few months. A worker always faces this dilemma. Selection between bad and good is easy but the selection between two good things is very difficult. However, a person with an aim in life has to select between good and good at every stage in life. Temptation is not only from the bad things but also good things and he might lose time in pursuing them. Reading all those books in that library was good, but his time would have been lost, and the intended book would not have taken shape. Are we living a purposeful life or a moment-to-moment life? And further he gives example of a dog and makes one understand as to what is moment to moment life. He says : A dog's life is a moment-to-moment life. It is propelled by the desires and has no purpose in life. The instinct which is predominant for the moment is satisfied by a dog. It feels hungry, it goes in search of food, finds it somehow, somewhere and the hunger is appeased; it has nothing to do thereafter. It feels sleepy, it sleeps; it feels like enjoying, it enjoys; thus the desire for the moment is sought to be satisfied. There is no purpose or goal of life for which a dog strives and lives. Thus, the four natural instincts or hungers are satisfied by a dog. Having known this, he puts very probing questions : "Am I to lead a dog's life? What should I do? I am a human being and I must know how to live for a purpose. Why do I live?" These are the questions that every youth must ask himself. If you ask any Indian youth today why he lives, the reply will be "because he does not die". One must have something to live for and to die for. The pursuit to achieve the goal will not be lost even if one dies. A purposeful life is a planned life and there is no importance to personal instincts. Man should not be a product of atmosphere; he should not be at the mercy of circumstances. If the river flows from east to west and if one has to go to the east, he must go against the current. Here he cites another example of stray cattle : One's life should not be like that of the stray cattle in the cities. When person go behind them to take them to cattlepound they close all the avenues and keep only that open which leads to cattle-pound. The cattle just seeing the other roads blocked by these men take to the road which appears favourable but they end up in confinement of cattle-pound. Our life should be just like these cattle avoiding the obstacles and difficulties and ultimately ending up meaninglessly. Many young men are creatures of circumstances. They try to make their way where circumstances are favourable. They aspire to go to medical faculty; if that is not possible, try for engineering side, if not, then be a B.Com, if that is not favourable, then try something else. If the road to one aspiration is blocked, leave it and try another like the cattle and the dog which go by the way they find easy. You must always remember that you are a man, a rational animal and you must pave your way for liberation. Strive hard, build up your future and reach the final goal. You have the power and faculties to live a purposeful life. Think always how you can contribute to the betterment of the world. What account of your life are you going to render? A great philosophy of life which can be actualised with determined efforts has been told here by Eknathji giving practical steps in realisation of the ultimate goal of lie. He says : This life must pave for the next higher life. But this life is also very short. One has to utilize it in the best possible way, with powers granted to him by God, within the short period at one's disposal. One has to march on the life's way towards the end with the help of five Jnanendriyas (the sense-organs) and five Karmendriyas (the organs of action). Life is a gymnasium where you have to display the best that you possess within the short time allotted to you. You have to be extremely careful to see that the time and the energy are not wasted and that the way for the next higher life is paved by you. So we are to take care of God given instruments of Jnanedriyas and Karmedriyas and with that the Time and Energy. The more we are in a position to look into these four aspects, remain careful in utilising them and orienting them to the avowed goal, we have taken care of the steps. That should assure us that we shall reach the goal. The 3Ps of Swamiji - Purity, Patience, Perseverance- need to be given proper thought minute to minute. Human life is a combination of time and energy. The five sense organs viz. ears, skin, eyes, tongue and nose consume energy for listening, touching, seeing, tasting and smelling and the organs of action viz. Hands, feet, speech and the two senses of excretion also utilize the energy for their activity. Thus the organs of understanding and of action are instruments. There is also the eleventh organ, mind. But all these organs are time-bound, there is a limited time for them and they have to do their best in the allotted span of life. They have to pave the way for the next life and build one's future. The goal is not to be reached in one life, so one must move from target to target and therefore a master plan for this life is most essential. We should live for a specific purpose, lead a purposeful life. "We have taken the decision and have already started on the path. We have to utilize the full span of life to achieve the goal of our life, the mission of our existence in this world!" The "pilgrim's progress" from mere physical hunger to hunger for immortality or from Kama to Moksha or from human to superhuman and from there to Divine or otherwise, as from selfishness to enlightened selfishness and to enlightenment itself is to be achieved. This has been clearly stated in Swamiji's well-known words "Each soul is potentially Divine. The goal of life is to manifest this Divinity within, by controlling nature, external and internal. Do it by work or worship, philosophy or psychic control, by one or more or all of them and be free." These state that the goal or purpose of life is to realize that eternity or divinity which is within every individual. It has to be realized only by oneself. Different avenues for the achievement of that goal in the form of Jnanayoga, Bhaktiyoga, Karmayoga, Rajayoga have also been clearly indicated by Swamiji. It is left to us as to which avenue one should follow to reach the goal. Mananeeya Eknathji says : This goal cannot be achieved in one life. The journey is too long, but one has to perform it. If we come across anybody achieving this eternity in this very life, it means that he must have lived thousands and millions of lives before; he must have striven very hard before and this was his last halt to reach the destination. As Tukaram, the celebrated Marathi sain t has affirmed- "Yachi dehi yachi dola, Pahina mukticha sohala "In this very body and with these very eyes, I shall enjoy the great festival of final liberation." It is the birthright of every individual to enjoy this, provided proper care is taken to see that his rationality is not lost and he does not regress to animality. That brings the stark reality of working very hard with a goal and make life purposeful. Eknathji brings to all the way to be followed to make the life purposeful. The goal of human life is one and one only. There are no two opinions nor is there any discussion or question about it. It is decided once and for all. One may take cognizance of it today, 25 years later or even 25 births after, but it is one and constant. In the words of Swamiji, it is : "Each soul is potentially Divine. The goal of life is to manifest this Divinity within, by controlling nature, external and internal. Do it by work or worship, philosophy or psychic control, by one or more or all of them and be free." Why do we not do it today? The journey will be less tedious. Final liberation is the goal for all and there is no choice left to anybody. It has been declared by our ancient seers, long, long back for the benefit of the world and our elders have realized and experienced the same. Every nation, as Swamiji affirmed, has to fulfill its mission. Swami Vivekananda had said : Each nation has a destiny to fulfil, each nation has a message to deliver, each nation has a mission to accomplish. Therefore, from the very start, we must have to understand the mission of our own race, the destiny it has to fulfil, the place it has to occupy in the march of nations, the note which it has to contribute to the harmony of races. The destiny of this nation was also seen by Swamiji and it is to give a lead to the rest of the world. Up India! Conquer the world with your spirituality! Having grasped it, now the choice is left to us. Eknathji appeals : In what manner are we going to achieve this goal? What am I expected to do in this? What is the purpose of my life? What is the mission of my life? 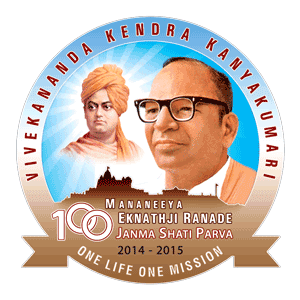 Having join the Vivekananda Kendra order, the decision has been taken. The need is to work on the chosen path and hence make best of every minute available, every opportunity that we get. Ekanthji says : We have taken the decision and have already started on the path. We have to utilize the full span of life to achieve the goal of our life, the mission of our existence in this world! Darwin propounded the theory of evolution, according to which this world has evolved by certain stages. In Indian philosophy, there is no evolution but unfoldment. The world is being unfolded, gradually leading it to perfection. There is progressive striving towards perfection. The potential "becoming" is leading towards "Being". The superman has to be transformed into a divine person and for that we are unfolding ourselves. These two ideas of evolution and unfoldment are diametrically opposite. Swami Vivekananda therefore declared in a forceful manner, "Each soul is potentially Divine. The goal of life is to manifest this Divinity within, by controlling nature, external and internal. Do it by work or worship, philosophy or psychic control, by one or more or all of them and be free." Think over it again and again—digest it inwardly. It is the most important statement and every word of it is used advisedly. Either out of ignorance or hesitation or disregard, one may avoid to bestow thought on it and act accordingly; but ultimately one has to come to it. There is no other way out. This is the quintessence of Indian philosophy in a nutshell. When some V.I.Ps come, I have to accompany them to the Rock Memorial. And after having observed all the things they sometimes remark, "How fine it is! We find three oceans coming together and we also see the different colours of three oceans, the Arabian sea, the Indian Ocean and the Bay of Bengal." I do appreciate their remark. I wonder whether there are really three oceans. The ocean is one only. It is for our convenience that we have named them differently and the colour of all of them is the same. The water of the ocean has one colour only. But due to the depth or shallowness of the waters or due to the reflection of the sky we speak of their having different colours. So also, all forms of life are one. One can just name them differently to distinguish one from the other. We name also abstract things. We call Gunas by different names, but there is no watertight comparmentation as such. Every Guna has the mixture of two other Gunas also but to show the predominance of one particular quality, we name it by that quality. By which attribute can we label Swami Vivekananda? Was he a Jnanayogi or Karmayogi or Bhaktiyogi or Rajayogi? As a matter of fact, no yoga is complete without the presence of other yogas. It is by the comparative preponderance of the one over the rest of them, that entitles it to be named by that yoga. God is one but we have so many deities and so many stotras on each one of them. This is not multiplicity, but it is unity in diversity.